Injustice is just so... unjust! It's a wrong that demands to be made right. When it happens to us, those close to us, or the innocent and defenseless it stirs up anger inside of us and we want some type of justice done. The greater the indifference or wrong on the part of the offender, the stronger the reaction and demand for justice. Sadly, we can be unaware of our own indifference, even a heartlessness when we cause heartache or wrong others. What's worse is when we are numb and hardened to the cries of the victims of injustice. But it never goes unnoticed. One person, who is able to bring about true and full justice, not only sees it but holds each one of us accountable for our life. Parables are often associated with Jesus but they are common throughout history in many cultures. Solomon, King David's son through Bathsheba, used several parables in his writing in the book of Proverbs. Before King Solomon was born, the prophet Nathan told King David a telling parable. One he would never forget. It's found in 2 Samuel 12:1-4 (GW). It begins, “There were two men in a certain city. One was rich, and the other was poor." The contrast and injustice become more clear as the parable unfolds. It tells of a wealthy man with many flocks who took the pet lamb of a poor man to feed a visitor. The rich man had a very large number of sheep and cows, but the poor man had only one little female lamb that he had bought. He raised her, and she grew up in his home with his children. She would eat his food and drink from his cup. She rested in his arms and was like a daughter. As Jesus often did with His parables, Nathan used the parable to convey a simple truth but with a catch. As David heard the parable he responded in an immediate and strong way (2 Sam 12:5-6 GW). In doing so, he convicted himself of his own sin. One important factor for understanding parables is the setting for the parable itself. It often reveals why the parable is told. We need to read the story in the previous chapter (2 Sam 11) to understand why this parable impacts David the way it does. David was the great warrior king of Israel but he chose to stay back and send his army to battle without him. One day after a nap, David took a stroll on his rooftop and saw a beautiful woman bathing. Her name was Bathsheba, the wife of Uriah the Hittite. The enemy of our souls had set a trap and David fell for it. David ignored this woman's marriage and had her brought to his palace. When she became pregnant, David tried to cover his sin. He called her husband home from the war thinking Uriah would sleep with his wife while at home and assume he impregnated his wife. But things did not go as expected (2 Sam 11:8-13). 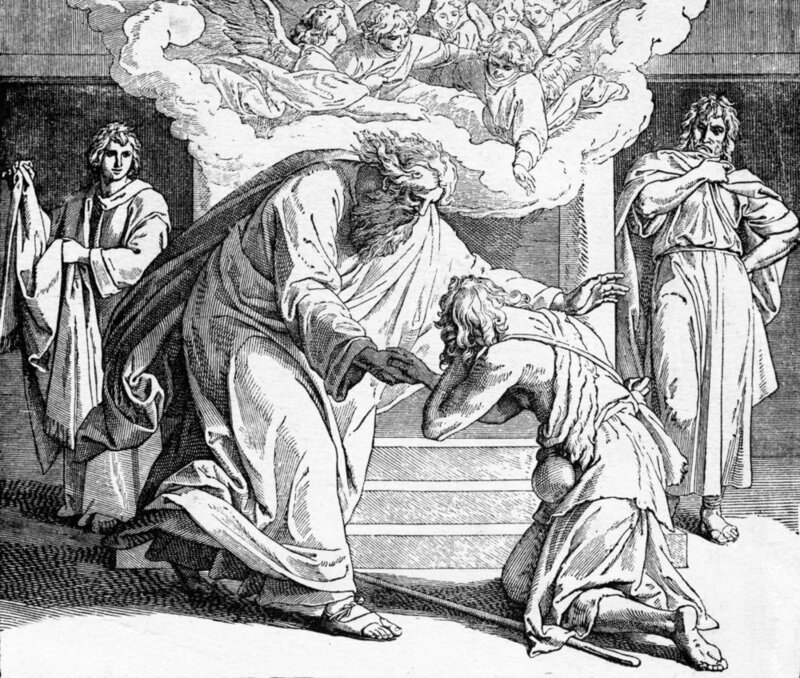 David did not count on Uriah's loyalty to his soldiers and his honorable character, which was greater than his king. The reactions of the very first encounter with the clever adversary of our soul are seen in David's next decision—the murder of Uriah. King David instructs his general Joab to put Uriah on the front line of battle then pull back from him. He took advantage of Uriah's loyal and honest character (2 Sam 11:14-17). And so, Uriah's unnecessary death was the consequence of David's ill-fated attempt to cover his sin. What we see of David in this story lurks in all of us. His reaction to Nathan's parable reflects our natural unredeemed self. We condemn ourselves when we cry out for justice on others without realizing our own wrongness and our need for mercy. None of us are as innocent as we may think. None of us will avoid true justice—the accounting of our life before the One True and Righteous Judge. But we all need His mercy! Next week, I'll look into the consequences—the judgment—of David's sin with Bathsheba and Uriah and his response to it. It just might surprise you! Judgment is a part of God's redemptive story. It's like drawing a line for what God says is acceptable in His eyes. It's not mere punishment. It has a purpose. God desires for His judgment to lead to correction and restoration. What bothers you most about David's actions? His weakness of temptation, the adultery, the attempt to cover his sin, the murder of Uriah, or David's calculating hardness of heart? Why and which do you relate to most? What we condemn in others is often what dwells in our own heart.